City Park Equipment was created in 1991 by Landscape Architect Carlos Preston, who envisioned a company with professional standards and values, where honesty and trust would be key elements. Back then, there was a need in our market for an expert to provide architects, designers and clients a comprehensive guide to outdoor environmental design products to be specified and supplied locally in a reliable and trustworthy manner. City Park Equipment started as a one man operation and since then we have grown to become a Team of dedicated and qualified professionals who strive to be well informed, educated and committed with the mission and vision of the company. 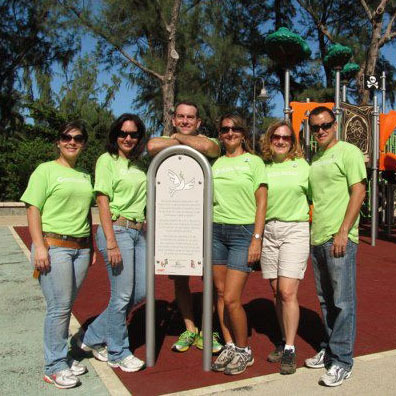 To be the premier provider of high quality commercial site furniture and playground equipment in Puerto Rico, the Virgin Islands and the Dominican Republic, maintaining always the highest standard of customer service. Playworld Systems has been our partner for the playground and fitness equipment since 1992. We can design custom structures and/or have one of our Certified Playground Safety Inspectors visit your location for free consulting regarding safety and quality. We represent Playworld Systems in Puerto Rico, the Dominican Republic and the Virgin Islands. DuMor was one of our first partners in 1991 and is a leading manufacturer of site furnishings including steel, wood and recycled plastic benches, trash receptacles, tables, planters and custom products. We represent DuMor in Puerto Rico and the Virgin Islands. Landscape Forms has been our partner for commercial site furnishings and street lighting since 2004. For more than 40 years Landscape Forms has been producing site furniture and accessories that help designers and other clients create a sense of place in outdoor environments. We represent Landscape Forms in Puerto Rico. Grupo Fabregas has been our partner from Spain since 2013. A global leader in Foundry and high quality Polyethylene, Fabregas designs, manufactures and distributes Site Furniture, Covers, BIOSALUDABLE Fitness Equipment and Playgrounds as well as Drinking Fountains, Tree Grates and Grills. We represent Fabregas in Puerto Rico. Petersen Manufacturing concrete Site Furnishings have been our partners since 1991. Strength, flexibility and aesthetics are values that define Petersen Manufacturing. Choose from the many styles of planters, bollards, tables, trash receptacles and benches. We represent Petersen Manufacturing in Puerto Rico. Classic Recreation Systems has been our ally for Shade Structures, Shelters, Gazebos, Kiosks since 1998. For over 20 years Classic has served the needs of landscape architects, city planners, and park designers with steel structures that protect against the elements. We represent Classic Recreation Systems in Puerto Rico, the Dominican Republic and the Virgin Islands. Benito Urban has been our partner from Spain since 2011. A global leader in Urban Equipment Benito designs, manufactures and distributes Street Lighting, Site Furnishing, Fitness Equipment as well as Covers and Grates. We represent Benito in Puerto Rico. SuperSafe has been working closely with us since 2008. Manufacturers of rubber tiles which are not only environmental friendly but also safe and easy to install. SuperSafe™ Safety Rubber Tiles are ideal for Playground & Parks, Day Care Centers, Recreational & Park Areas and more. We represent SuperSafe in Puerto Rico. Concord Industries has been our partner since 1993. Concord’s flagpole shafts are manufactured in the United States and tapered aluminum flagpoles are their specialty. Concord has been manufacturing aluminum flagpoles for over 50 years offering the best value in outdoor flagpoles. We represent Concord Industries in Puerto Rico. Shade Systems has been our partner since 2010. Manufacturers of outdoor fabric shade covers, sun shade structures, canopies, tents, commercial umbrellas, and shade shelters perfect for playgrounds, pools, schools, and other outdoor spaces. We represent Shade Systems in Puerto Rico. Stern-Williams partnership with us started in 1995. Manufacturers of a complete line of wall hung drinking fountains and aggregate pedestal fountains, they have continued to develop and are proud to also offer stainless steel and metal fountains in several designs as well. We represent Stern-Williams in Puerto Rico. Waterplay has been our Canadian partner for water park needs since 2010. With 27 years of experience, Waterplay has been designing and building aquatic play features creating environments that promote exploration and discovery, fostering imaginative, interactive play. From fun aquatic play features like Dumping Buckets, Spirals & Arches, Columns, Flowers & Trees and Water Slides to Urban Water Features, architecturally and artistically inspired, Waterplay’s Project Support Specialists will work with designers, managers, contractors and subcontractors to create a successful project from concept to construction through to completion. We represent Waterplay in Puerto Rico.